With spring just around the corner, paddlers already are making plans. And some are thinking about the waters of Lake Michigan. This is likely to be a big year for the Lake Michigan Water Trail, the four-state project that began in 2011. Paddling groups in Michigan, Wisconsin, Indiana and Illinois, along with community, business and government organizations, have been working to identify launch sites, camping spots and other attractions. The Michigan portion is 1,200 miles long, and paddlers are encouraged this year to get out and blaze new trail segments. “We’re encouraging people to pick a leg over the summer and paddle (it),” said Dave Lemberg, an associate professor with Western Michigan University and the coordinator for the Michigan segment. Lemberg spent a year on sabbatical taking inventory of what’s available along the Michigan shoreline. The project was funded by a Michigan Department of Environmental Quality Coastal Zone Management grant. That segment also would be listed on a proposed Lake Michigan water trail passport that paddlers can carry. Those who eventually complete the trail would get a certificate of completion, Lemberg said. The Lake Michigan Water Trail, for those who don’t know, was launched in the summer 2011 when then-U.S. Secretary of the Interior Ken Salazar made a stop in Chicago. 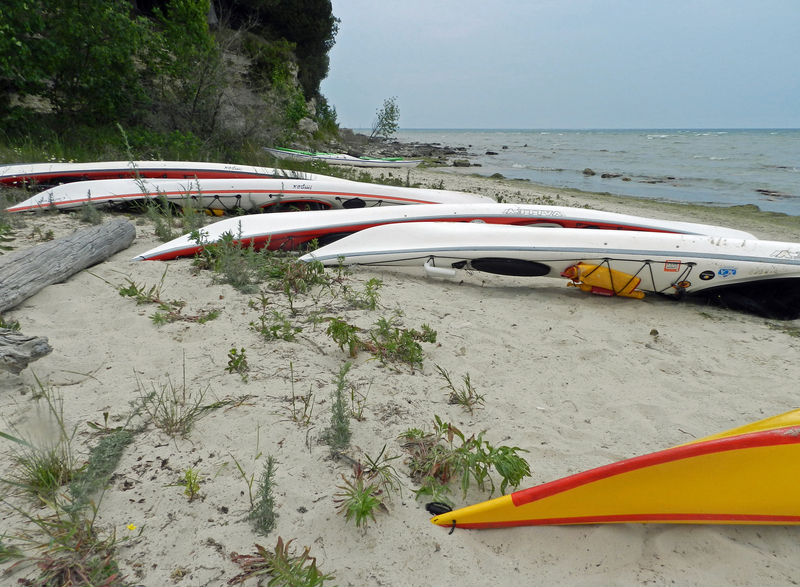 Paddlers take a break on the rocky shore of Rock Island State Park in Door County Wisconsin. Photo: Ken Braband. Trail System that includes scenic, historic and recreation trails. The 11-state Lewis and Clark National Historic Trail is one example. The 14-state Appalachian National Scenic Trail is another. Among those newly designated trails was a 75-mile segment of the Lake Michigan shoreline from northern Chicago south around Lake Michigan to New Buffalo, the first installation of the 1,600-mile trail that, when finished, will become a National Water Trail. 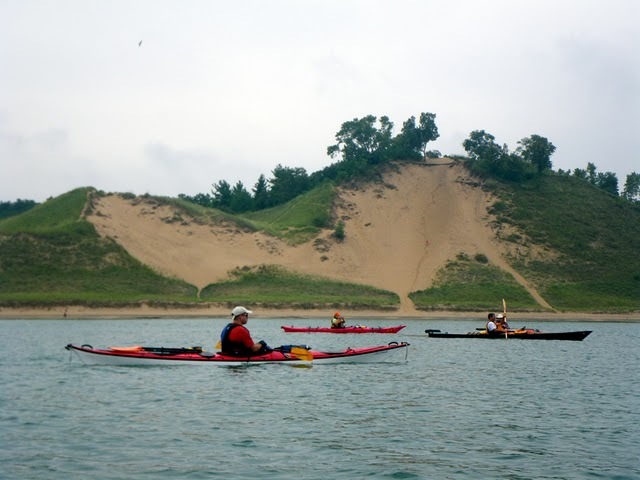 “The Lake Michigan Water Trail will be (to paddling) what the Appalachian Trail is to hiking. It will be the longest continuous-loop water trail in the world,” Dan Plath said. He is a kayaker from Westville, Ind., and the president of the Northwest Indiana Paddling Association, one of the founding groups in the Lake Michigan Water Trail Association. More on its work can be found online at nwipa.org. You can find out more about trail progress in each state at the Lake Michigan Water Trail Association website, lmwt.org. Paul Yauk, the land program manager for the Michigan Department of Natural Resources Parks and Recreation division, recently said water trails are “a critical part” of the draft state trails plan released this year. He foresees the DNR getting involved with the Lake Michigan trail, as well as with inland water trails. What paddlers also soon will have available are printable maps for the trail. Lemberg’s crew recently put a beta version online, but the regular link to those maps of the Michigan shoreline and its paddling assets will be on the LWMT site by the end of March. “The initial list of trailblazer legs will be up there by April 15, and the sign-ups for segments will be up by May 15,” Lemberg said. Paddlers, of course, have been navigating segments of Lake Michigan for years. But Lemberg and others hope to get them involved in the development of the water trail. “That’s why we are doing the Trail Blazer,” Lemberg said. 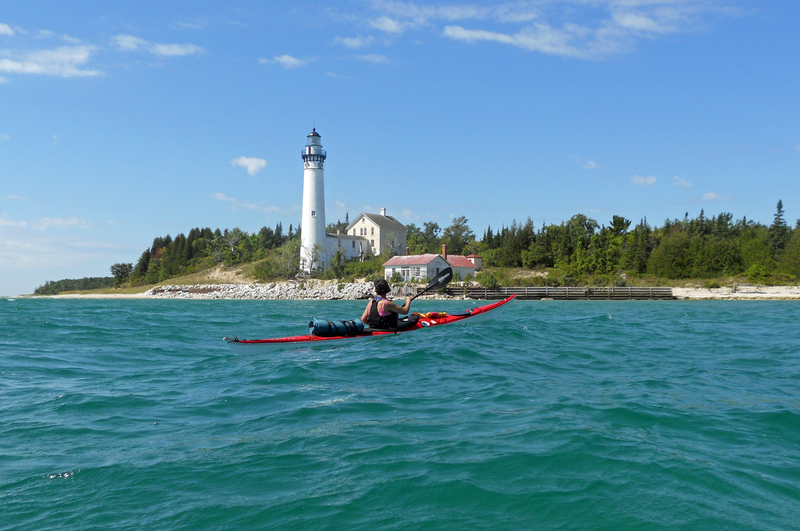 If you are thinking about a kayak trip along the Lake Michigan coastline this season, whether it be from one port to another or a longer expedition, be sure to check out the maps that soon will be available. And consider becoming a part of what is developing there. Every effort likely will have a payback for paddlers. This entry was posted in Uncategorized and tagged Appalachian Trail, Camping, Canoeing, DNR, Kayaking, Lake Michigan, Lake Michigan Water Trail, Michigan Department of Natural Resources, National Recreation Trail, National Trail System, Paddling, Trail Blazer, Water Trails, Wisconsin. Bookmark the permalink.